A couple of weeks later, the glassmaster posted a Shot of the Week entry that featured two Chicago glasses from Benzli V. Zahn Company. Well, Robin’s comment, plus these two glasses, struck a nerve with me. I suppose it was because I was familiar with the “cheater” style Zahn glass. And I had mentioned this company in my December 2007 column. But in any event, I decided that a “Common Stuff” column featuring just one obscure company that apparently bridged the shot glass gap between pre-pro and post-pro might be interesting. 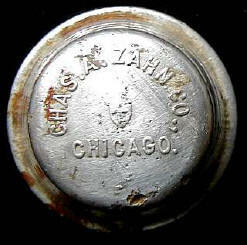 The firm began as Benzli & Zahn in 1887, but in 1894 the name was changed to Chas. 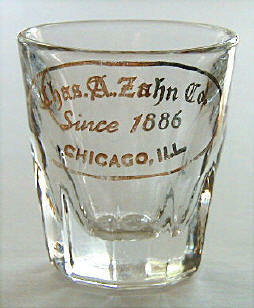 A. Zahn Co. This latter name lasted to Prohibition. The company was on Milwaukee Avenue in Chicago throughout its pre-pro existence. But the glasses that this company left in its wake seem to indicate that it survived into the post-pro years as well. This fluted and thin-wall Cream of Pennsylvania glass is clearly pre-pro. 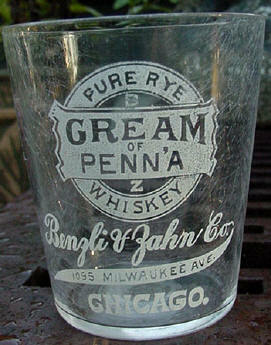 The same is true of this other rye glass. But this metal cup is certainly an enigma. Pre or pro, who knows? And finally, we come to this aforementioned “cheater” glass. 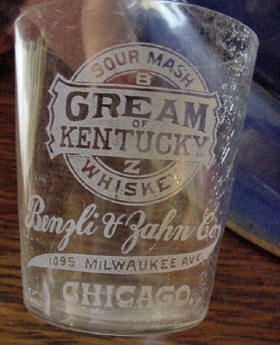 Note that this glass, like its pre-pro brethren above, has a fluted base. But it is here that the similarity ends. 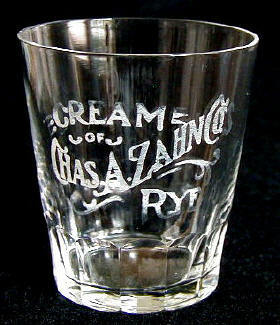 The shot is a gold-etched heavy bar glass that clearly has a post-pro look to it. When it comes to making the shot glass transition from pre-pro to post-pro, most would agree that Jack Daniels is a company that has killed the golden goose. The number of its post-pro glasses seems to be multiplying like rabbits. 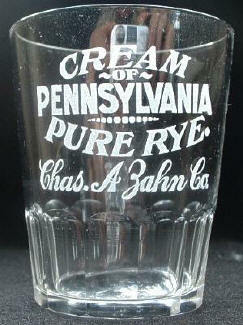 However, even the most discriminating pre-pro collector who already owns the “Cream of Pennsylvania/Pure Rye” glass might want to add the Zahn “cheater” glass to his collection as a not-too subtle illustration of how some companies traveled the pre-pro to post-pro highway.